The new meeting format worked well in September and we’re continuing with that format for October. We’ll be meeting an hour early at Panera down the street (walking distance) from the library. This will give us a chance to socialize and look at each other’s projects without cutting into our meeting and program time. It’s not mandatory to come to both parts of the meeting. It will be great to see you however you choose to participate. We’ll be meeting from 1:30-3:30pm as we usually do at Cary Memorial Library in Lexington, MA. We’re kicking off our Year of Colorwork! Karen has challenged us to swatch some mosaic crochet and bring in questions/insights to share. The pattern Karen suggests swatching is “Nya Mosaic Blanket” by Tatsiana Kupryianchyk, better known as Lilla Bjorn. There is a free version of the pattern with photo tutorials on her blog. Mary has some suggestions on the yahoo group on various ways to do the colorwork. If you haven’t already picked up a hook, there’s still time! What if you don’t have time to swatch? Come anyway! Learn from the discussion and/or contribute from past experience. Feel free to bring any charity items for donation. All are welcome. RSVP to fishnetcrocheters@gmail.com if you plan to attend. Please do not call the restaurant or the library. We’re trying a new meeting format this month. We’ll be meeting an hour early at Panera down the street (walking distance) from the library. This will give us a chance to socialize and look at each other’s projects without cutting into our meeting and program time. It’s not mandatory to come to both parts of the meeting but we’re looking forward to trying out this idea. It will be great to see you! We’ll be meeting from 1:30-3:30pm as we usually do at Cary Memorial Library in Lexington, MA. If you can’t come to the social portion or go into auto pilot that day, this part is not changing! We’ll be in the same place as usual for the business news and program portion of the meeting. Karen will be presenting on Mosaic Crochet. Mosaic crochet is a method of using multiple colors to make intricate patterns. Even though it looks like the colors are changed mid-row, the technique uses long stitches which only require color changes at the end of the row. The result is a thicker fabric. Examples of mosaic crochet from google image search. The possibilities for intricate designs are endless. 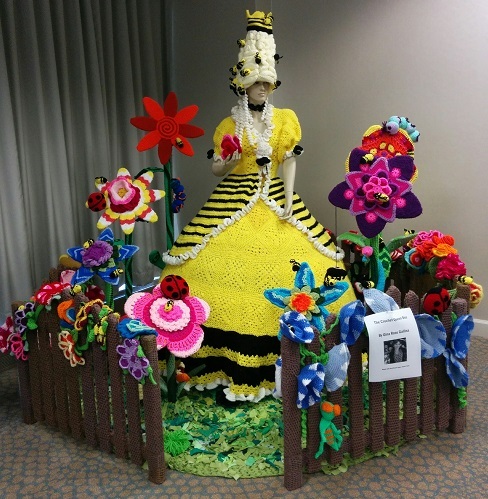 This display, entitled The Crochet Queen Bee by Gina Rose Gallina was just amazing! At full human height, it took up an entire corner of the crochet lounge. The entire dress, wig, flowers, bees, etc. were all crocheted. A few of us Fishnet Crocheters went to the CGOA Chain Link Conference in Illinois this year. Every year design competition entries are set out for all attendees to see. This year, the display was in the crochet lounge. We took a field trip to Kinokuniya Books, a Japanese bookstore in the Chicago area to check out their selection of Japanese crochet books. There are several design award categories and winners are chosen by experienced judges. But there is also a vote open to all attendees for the people’s choice favorite. We took classes, crocheted in public, met other crochet enthusiasts. 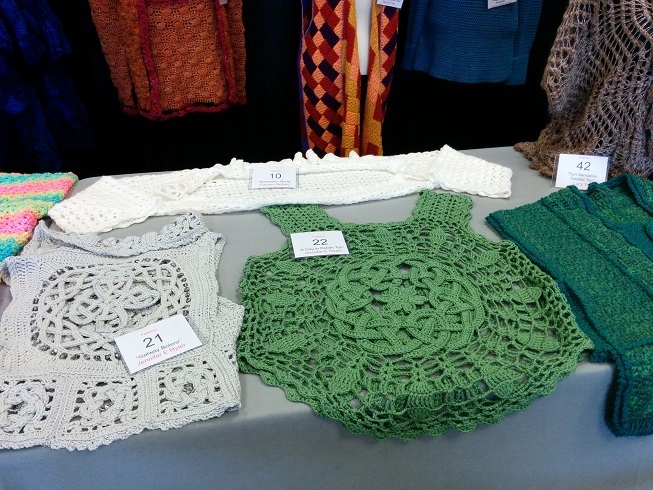 We saw items entered into the design competition and attended a crochet fashion show. We also brought home a lot of new ideas for our crochet chapter. 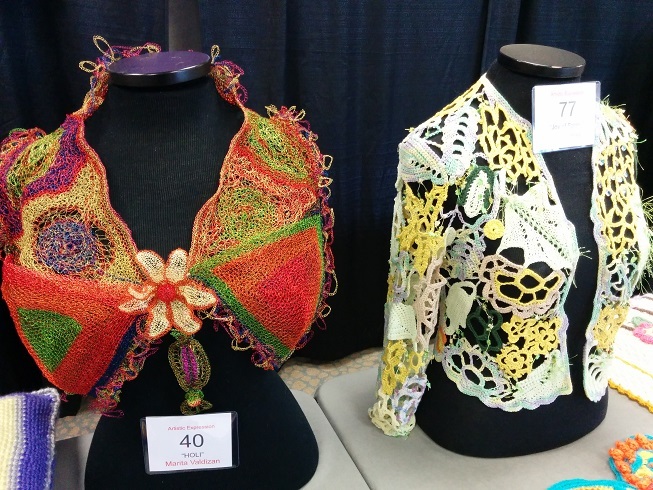 Enjoy some photos from the conference design competition and crochet displays. It’s a great place to see new techniques and materials. The item on the left was crocheted entirely of wire. 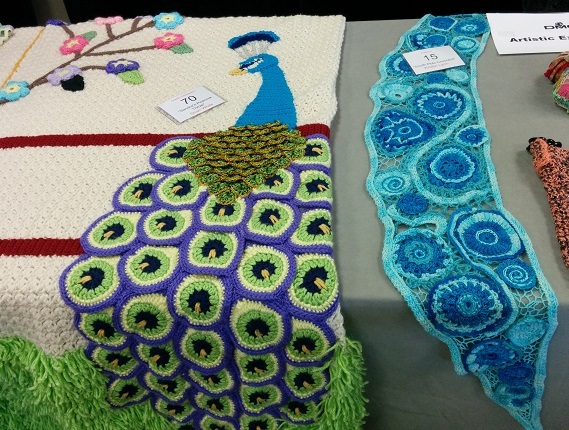 This free form crocheted wall hanging may have been the people’s choice winner. 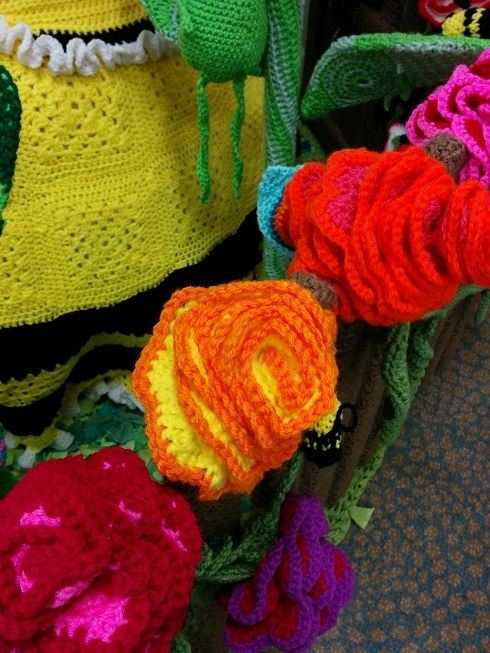 Karen will show us some crochet edgings great for borders on your crochet or knit items. Please bring your charity items for donation. Karen will be teaching Tunisian crochet beyond simple stitch. Please bring some light colored worsted or dk weight yarn and a Tunisian hook sized to work with it (a size J or K will do). If you don’t have a Tunisian hook, a regular size J or K hook with a handle long enough to hold about 15 stitches will do. Please share your progress on CGOA’s Warm Up America Challenge. See the Warm Up America Website for their requirements (7″ x 9″ sections) and sample patterns. All are welcome. RSVP to fishnetcrocheters@gmail.com if you plan to attend. Please do not call the library. Karen will be demonstrating how to make Tunisian mitres. Mikey, of the Crochet Crowd, has a whole video series about Tunisian crochet. Lessons 1 and Lesson 2 should be sufficient. Or review via your favorite print source of basic crochet. J or K hook. You will not need a Tunisian hook (unless you want to use one) because there will be a maximum of 15 loops on the hook at one time, just bring a hook with a fairly round cross-section, i.e. no large grip or big thumb indent. Bamboo hooks work well, as do the inexpensive plastic ones. Clover gold hooks and many comfort grip hooks have too short a throat.